Having beautiful lashes is more important than ever in your grooming routine; with the latest focus on natural beauty and pared-down makeup routines, complex eyeshadow looks are taking a step back and the lashes are doing the talking. That’s why everyone should be aware of every step that can take lashes from ok to wow! Here are the 10 eyelash hacks every lash lover should know! Curled eyelashes give you that cute doll-eye effect and they open up your eyes more, making you look more alert. 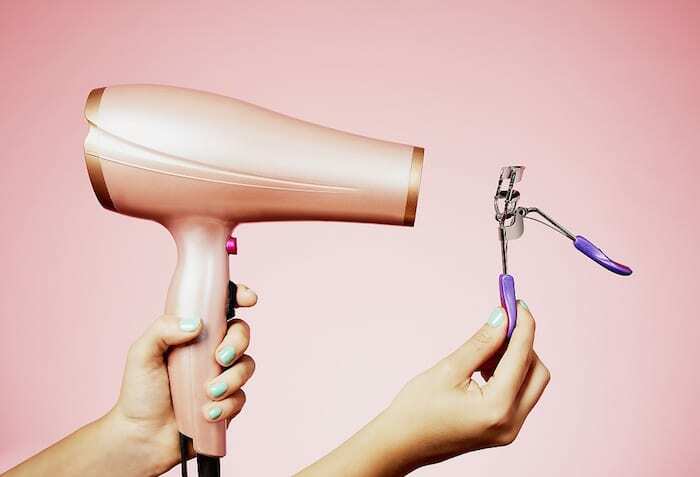 But we weren’t all blessed with naturally curled lashes, and sometimes, even the trusty eyelash curler doesn’t do the trick as well as you want it to. But have you tried heating it up? This works on the same principle as any sort of hair curling – if you use a heated tool to create the curl, and then allow it to cool down and “settle”, then it retains the style. You can achieve this effect by heating up your regular lash curlers with a hair dryer, or you can opt for a heated lash curler. And since we’re on lash curling – do you suffer from lashes that look exceptional when freshly made up, but then the curl drops halfway through your day? There’s a solution for that! You see, waterproof mascara has some special waxes that give it its waterproof quality (and make it nearly impossible to get off) and they fix your lashes into place. By applying it right after you curl your lashes, you effectively fix that curl into place, and it will hold the entire day with no sad drooping. Note: As awesome as waterproof mascara is, they’re a no-no when it comes to lash extensions. If you’re a lash extension addict, go for one of the best mascaras for extensions instead. Have you ever seen those little metal combs that usually come at the end of spoolies? They can look intimidating, but they’re your new best friends. That is a lash comb and it’s excellent for combing your lashes and separating them, not only in their natural state, but also after you’ve applied mascara. It’s the best way to get rid of clumps and achieve a cleaner, wispier lash look. Who hasn’t lost the battle with fake eyelash strips at least once in their life? They’re too long, too curved, there’s not enough glue, you can’t get both corners to stick to your lid, and they just seem impossible to work with, when you’re a beginner. But there’s a hack to make your life easier! Next time you try to put on lashes, try cutting the strip in 2 or 3 equal pieces. You end up with mini lash strips that are much easier to handle, maneuver, and glue down. You just glue them next to each other (or where you feel like you need a bit more fullness), and voila – your own personalized lashes. Why does no one tell us about mascara primer, growing up? That could avoid many 14-year-olds from sad, droopy lashes. Just like you use primer on your lids to help your eyeshadow look brighter and last longer, you can use primer on your lashes to help lengthen them, thicken them, and prepare them for mascara. Primer will usually be white in color but don’t worry, the mascara that you put on after covers it up and achieves a uniform look. Your lashes will look better and be stronger thanks to that layer of primer. And speaking of layering, sometimes the perfect lashes are a result of just the right concoction of mascaras. Most people limit themselves to just one, but when one product doesn’t satisfy all of your needs, it’s time to branch out and bring in some helpers. Who says that you can’t do one coat of multiple mascaras? Let’s say you’ve got one mascara that’s incredible for volume, and one that gives you great results, length-wise. You don’t have to choose between them; bring them together in a marriage that can create a beautiful lash look! You just need to apply your mascaras like you do normally, preferably by starting with the thinner formula first; these are usually the ones that are good for achieving length. Then, you can come in and layer your volumizing mascara over that. Finish with a nice comb-through. We put a lot of emphasis on hydrating, moisturizing, and conditioning everything from our skin to our lips, and to our hair. Why would we ignore our lashes? Conditioning your lashes may seem bougie, but it’s actually an essential step in making sure that you have strong, healthy, beautiful lashes, long-term. Especially if you wear makeup regularly, your lashes are probably dried out and a little fragile. As much as we love it, mascara is usually the culprit for weak lashes, particularly waterproof products. Makeup remover doesn’t help either, and neither does the eye rubbing. That’s why it’s important to take this time to maintain your natural lashes. It doesn’t take a lot to do it – just purchase a lash conditioner (not to be confused with a lash serum, that promotes growth) and apply it every night before you go to bed, but after you take your makeup off. You looove that curled eyelash look, but you hate mascara (or perhaps you have sensitive eyes), and your eyelash curler doesn’t seem to keep your curl well enough. What if we told you that there’s such a thing as a perm for your eyelashes? Yes, exactly like the one for your hair. And if in the case of your hair, the answer to the question “To perm or not to perm?” is always a resounding “NO!”, with lashes, it’s a little bit different. Also known as a lash lift, or LVL, an eyelash perm is pretty much exactly what it sounds like: you go in and you perm your lashes chemically with a special solution. The process is not painful, and takes around an hour and a half, with results that are visible for the next 6 to 8 weeks! You can also get your lashes tinted at the same time, so your lash maintenance can fall to a minimum. You truly will be able to say “I woke up like this”. We know, we know; technically, fake eyelashes are a one-use product – use once, then throw them away. But that would not only be expensive, it would be downright wasteful, and bad for the environment. We’re all big environmentalists here. What if we told you your lashes can be re-used several times? Here is how you can take care of them to get the most life out of them and the most bang for your buck! When taking the lashes out of their packet, grab at one end and gently pry them away from the little plastic tray, careful not to bend or damage the hairs. Handle them with care when applying, and try not to be very rough with your tweezers; if possible, don’t use them at all. Take them off the same way you did out of the packet: grab at one end and gently peel them off. With a cotton bud and some warm water, gently clean the glue off the lashes. Leave your lashes to dry and store them in the same container they came in; the little plastic tray is especially made to retain their shape for as long as possible. Do you want long, fluttery lashes and products like Latisse are outside your budget? You may still be able to achieve the same kind of growth. Castor oil, biotin, and other substances have properties that promote hair growth, strength, and thickness. Not only are they great for your hair, but they’re also effective for your lashes. Using castor oil for lash growth is super easy – just pour some oil on a clean spoolie and start brushing through your lashes, making sure you coat each and every one. Repeat this process every night, cleaning residue off in the morning, and you will see results in a few weeks. There you have it! 10 great eyelash hacks to incorporate into your daily routine for full, beautiful lashes!